The September issue of the Bulletin has been published and is available in both print and electronic versions. Below is the table of contents of this issue. 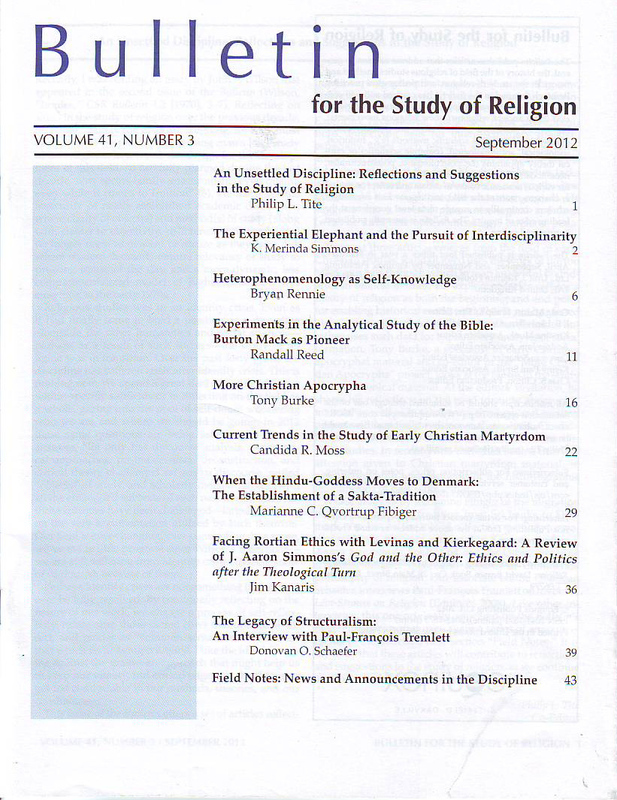 We are thrilled to have such a range of outstanding articles, many of which engage current trends in particular sub-disciplines of the field of religious studies. As always, we welcome submissions for future issues – including responses to published articles – from established scholars and graduate students engaged in the study of religion. Our guidelines are available online. In order to offer readers of the Bulletin’s blog a sense of what is being published in the Bulletin, over the next week or so we will be posting, along with the table of contents below, the editor’s introduction and a few blog entries by our authors that tie into her or his article. “An Unsettled Discipline: Reflections and Suggestions in the Study of Religion” (p. 1) – Philip L. Tite, University of Washington (editor’s introduction). “The Experiential Elephant and the Pursuit of Interdisciplinarity” (pp. 2-6) – K. Merinda Simmons, University of Alabama. “Heterophenomenology as Self-Knowledge” (pp. 6-11) – Bryan Rennie, Westminster College. “Experiments in the Analytical Study of the Bible: Burton Mack as Pioneer” (pp. 11-16) – Randall Reed, Appalachian State University. “More Christian Apocrypha” (pp. 16-21) – Tony Burke, York University. “Current Trends in the Study of Early Christian Martyrdom” (pp. 22-29) – Candida R Moss, University of Notre Dame. “When The Hindu-Goddess Moves To Denmark: The Establishment Of A Sakta-Tradition” (pp. 29-36) – Marianne C. Qvortrup Fibiger, Aarhus University. “Facing Rortian Ethics with Levinas and Kierkegaard: A Review of J. Aaron Simmons’s God and the Other: Ethics and Politics after the Theological Turn” (pp. 36-39) – Jim Kanaris, McGill University. “The Legacy of Structuralism: An Interview with Paul-François Tremlett” (pp. 39-43) – Donovan O. Schaefer, Le Moyne College. “Field Notes: News and Announcements in the Discipline” (pp. 43-45). This entry was posted in Academy, Announcements, Uncategorized and tagged Bulletin for the Study of Religion, Religion, religious studies, scholarship. Bookmark the permalink.